Can you believe all the snow in the northeast and it's still October...at least we have not had any here in Ohio. I made this quick card for a couple of challenges to use pink. I printed the image "Softly Afloat" from Paper Cupcakes, one I have used many times. I colored the image in Pink and Black with Copics and a Black Glaze Pen. 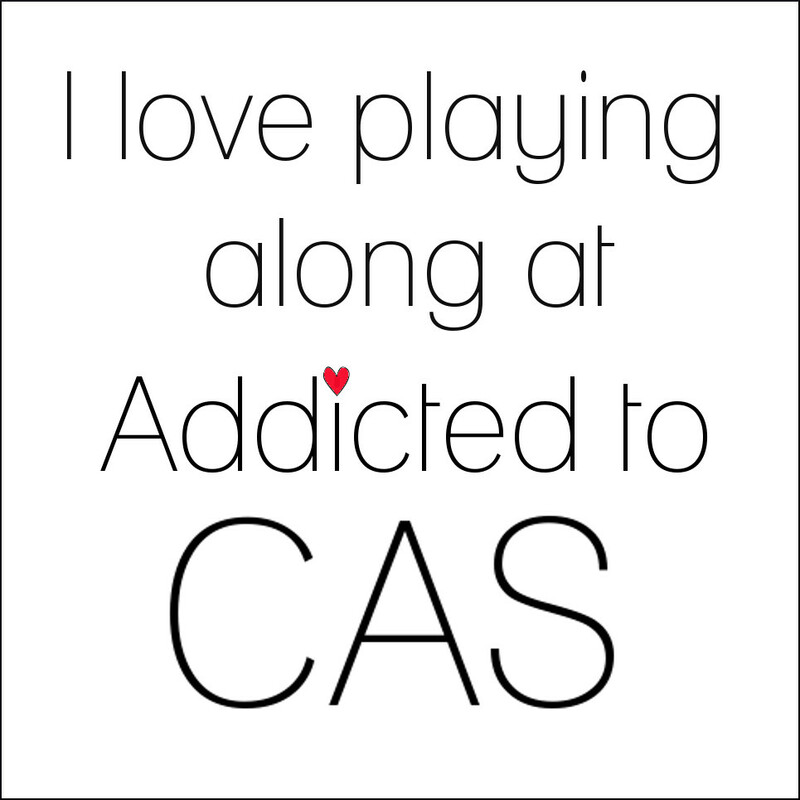 The image is on a mat of Black CS which I also used as the base. Added a mat of Floral Patterned Paper from my stash. Added a border of punched scallops (EK punch) and a strip of embossed (EF Polka Dots) pink paper sponged lightly with Memento London fog. Placed a couple of Black Pearls in the corner. Finished with a ticket from Paper Cupcakes "Variety Sayings". There's Magic in the Air: Tammy challenges us to use Pink and Black. The challenge at Joan's involves a technique used by Joan. 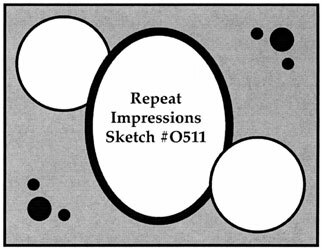 The entire challenge is to use Selma's new technique, use a combination of colors, use a tree, and use a flourish. The technique gives a snowy effect to the background. Complete directions are at Selma's blog here. My snow is not as good as the effect on Selma's card so I will have to practice more with the misting. But I think it is good enough for an entry for the challenge....just wish I had more snow? I used GKD Stamp "Life is Good" for the background and foreground trees and used distress inks Tumbled Glass and Broken China. The sentiment stamped in Versamark and heat embossed with Zing Silver EP is from Creative Clear Stamps. The flourish is cut with a Tim Holtz Die (belongs to my friend) from metallic Silver CS. I edged the image layer with Pilot Marker Silver pen before adhering to a card base of Glossy White CS same as the image was stamped. I really like this card but I had a hard time photographing with the metallic elements and having my snow show up. Challenges: Joan's Gardens- use Selma's snowy technique and othe elements listed above. CRAFTS AND ME: Theme is Winter Blues. Today looks like the Winter Blues are on the way! Lovely day here in Ohio but cold... in the hi 30's and may reach lo 40's. 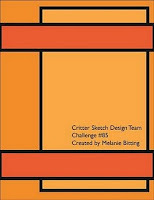 My card today is for the color challenge at CR84FN and using a sketch From Card Positioning system. This one is a bit different and more geometric than I have been doing lately. I used a base of a dark steel blue and matted with a gray cs embossed with CB EF Herringbone. 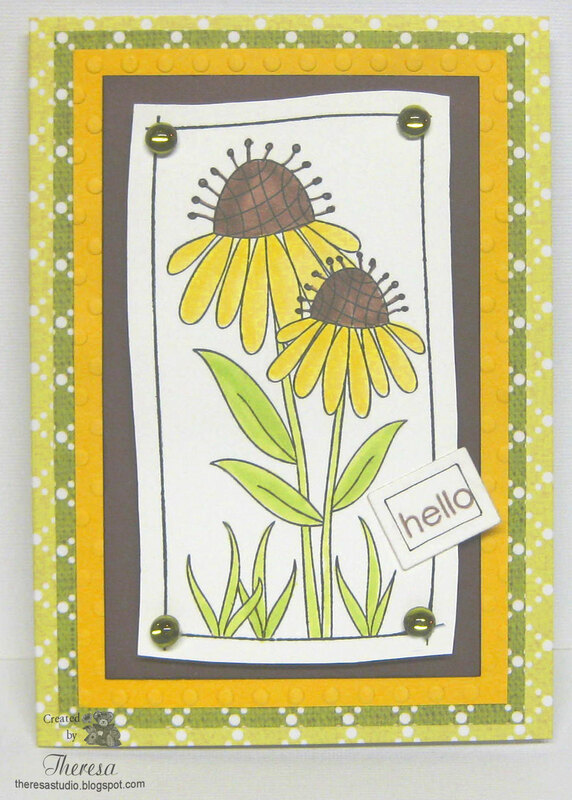 Added a panel of yellow cs embossed with CB EF Polka Dots and punched corners on one side. Then came a lighter steel blue ( reverse side of the same blue cs) that I embossed with Diamond Plate. 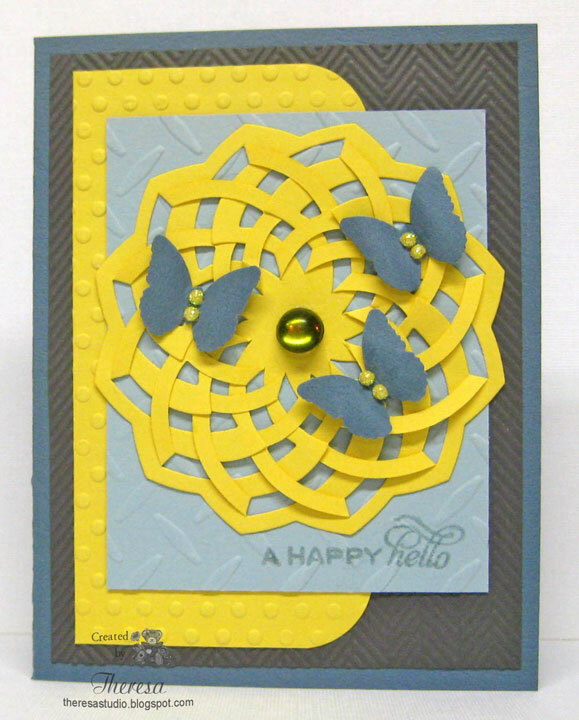 I then added the design cut with a Geo-Die in yellow cs and "threw" on some dark blue butterflies cut with Martha Stewart punch. Finished with large stone in center and glitter domes on butterflies. Stamped the sentiment from Flourishes "Taglines" with Memento London Fog and embossed with clear EP. 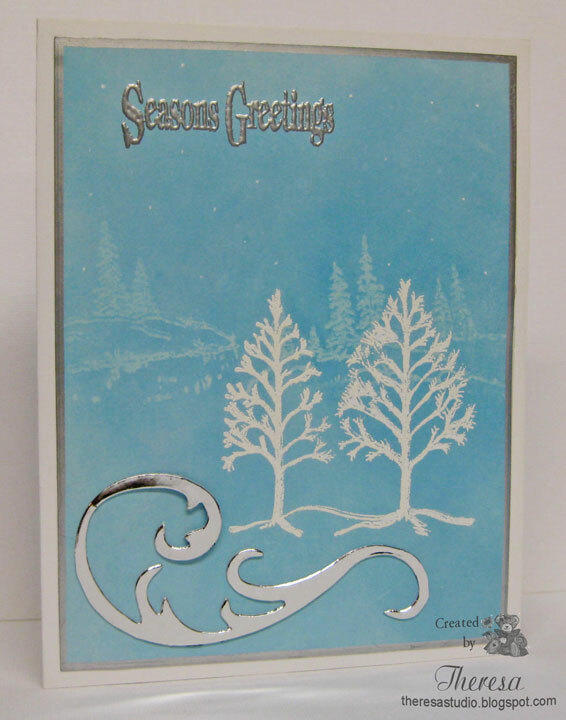 Not much stamping and no coloring going on here....just a lot of cutting, embossing, and punching to this card. I have long been a fan of Nina and her images at Paper Cupcakes and her challenges at There's Magic in the Air. I was thrilled to see that she is the sponsor this week at Sugar Creek Hollow and chose one of her images for the card that I made for their challenge. 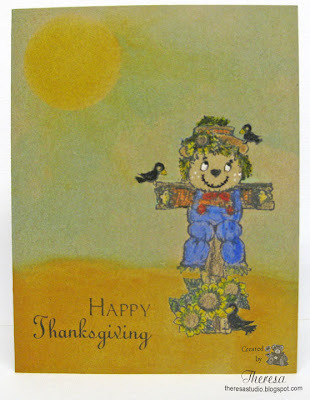 The challenge this week is to preserve the colors of fall by making a vintage, shabby chic or primitive card. I used the image Cornucopia that I colored in Copics of fall colors and sponged the image with distress inks Antique Linen and Tea Dye. 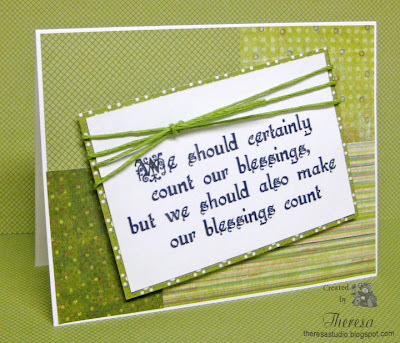 Added a sentiment from MFP's Country Thanksgiving stamped in Tea Dye .....think this font has a vintage look. To add more of a vintage feel, I placed the cut image on a torn rice paper mat. At least I think it is some kind of rice paper found in my stash that I had been saving. My card base is GKD's Pumpkin Spice CS that I distressed with scissors and sponged with the distress inks.To the base, I added a mat of parchment paper embossed with Victoria EF and also aged with distress ink. Distressed the edges with scissors. Added this very vintage looking and very old ribbon...at least I have it for a long time....to finish my design. I have used this image many times but this is my first card using it for this season. The Timeless Tuesday challenge is Trees & Leaves –Use a tree/leaf image(s)/element. Try not to use flowers as a focal point for your creation for the challenge. 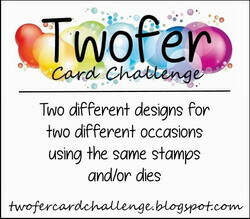 This was a bit of a challenge for me as I wanted to use Flourishes stamps for my card. Most of my Flourishes stamps are floral. 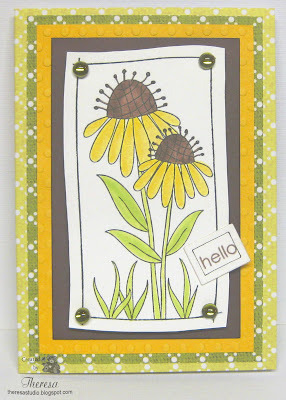 After searching my stamps, I found a leafy branch in the set "Humming Around" and designed my card "around" it. I stamped the branch 4 times using versamark and embossed with Ranger Pearl Gold EP.....first time to use the Pearl EP and really like the effect. 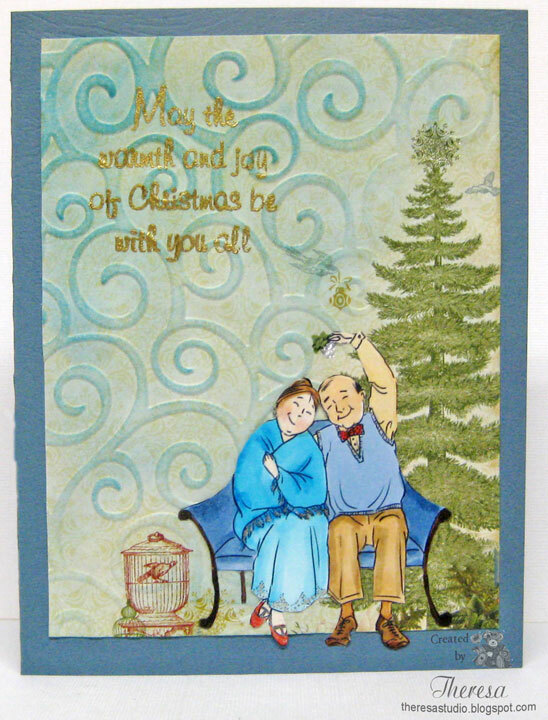 I used a blue CS from my stash which showed off the embossing. Reminds me of looking through the fall leaves on a tree when the sky is so blue on an autumn day. I colored the leaves with Copics R24 and YR65 and then added more color with red, orange, and green pencils. I stamped the sentiment "Happy Hello" from Flourishes "Taglines" also with versamark and the same EP....should have used the Copper EP so sentiment would have shown better in the photo. Oh well!! Next time. I then sponged the CS with Wild Honey Distress Ink adding a bit more around the sentiment so that it would show in the photo. I punched 2 corners with a corner punch and attached ribbon to the left edge. This green satin ribbon with copper leaves has been in my stash several years. I used a Copper Metallic CS as the base. I love all the metallic elements in this design but that makes for a challenge to photograph!! I had to take several photos before I finally had one to post. But the photo still does not do justice to the card. Much better in real life. I think I came up with a card that qualifies for the Timeless Tuesday challenge as well as a few others. Timeless Tuesday: The challenge is Trees and Leaves. 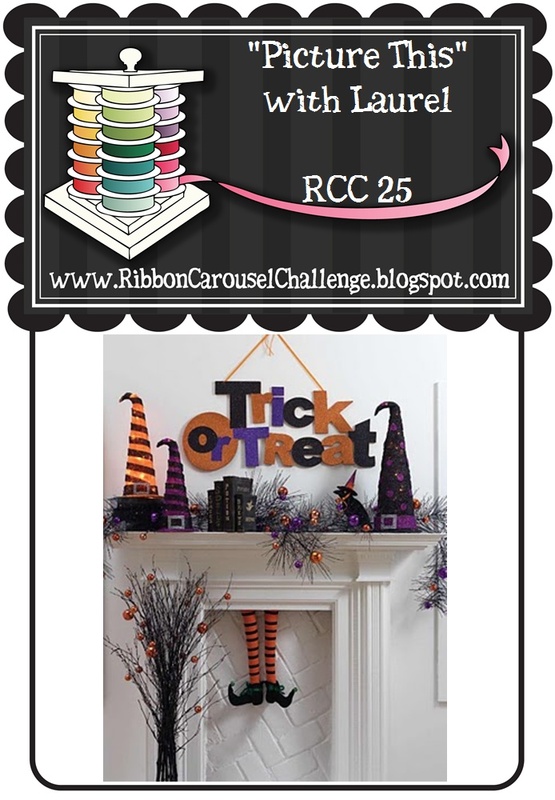 Really Reasonable Ribbon: Challenge #34 is Fun 4 Fall and ribbon. The fall leaves are falling quickly here with all the rain that we have been having. The color show will soon be ended. At Phindy's Place the challenge is Blue Christmas. I thought the "Improve With Age" image was a great choice to use for my card. I colored the image with Copics and cut it out and used a Webster's Page from "Waiting for Santa & Sweet Season" petite papers as the background that I embossed with CB EF Divine Swirls and sponged with blue distress inks. Added some liquid pearls to the mistletoe. 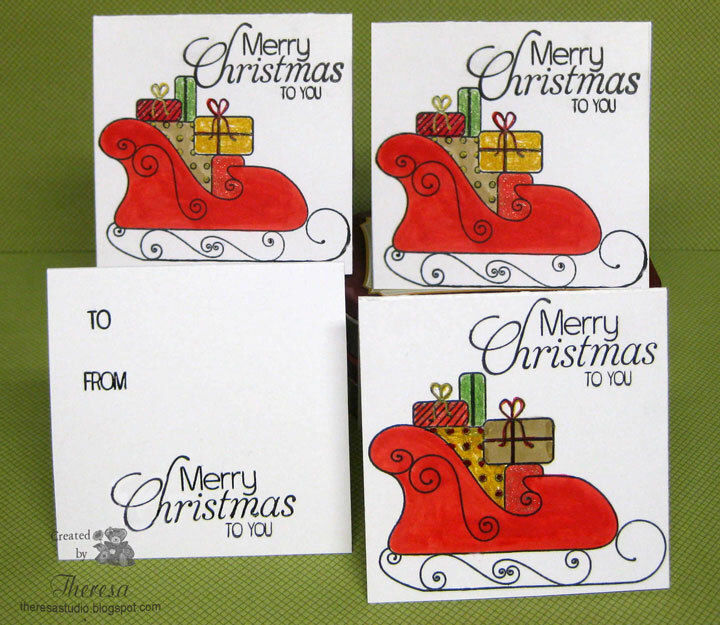 Added a Christmas sentiment from Creative Clear Stamps embossed in gold EP. Used a Blue CS from my stash as the base. Used Clearstar pen to add some highlights. I love this happy loving couple as my focus all dressed up in blues. Hope this card makes someone smile. 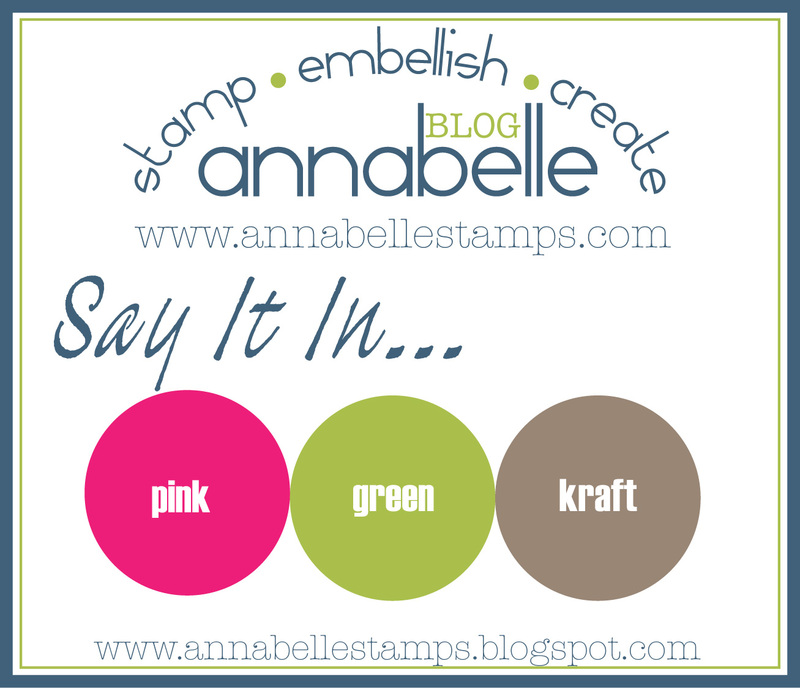 Annabelle's challenge this week is "Say it in ...pink, green, and kraft." I decided to make a non-traditional Christmas card with these colors seeing that the Annabelle Blog design team created some lovely holiday cards with this combo. I don't usually stray far away from traditional colors for Christmas. 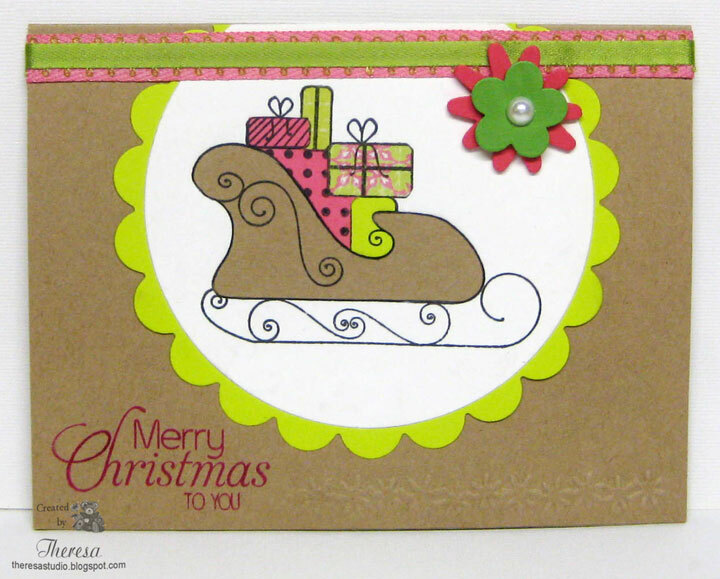 Using a sketch from Card Patterns, I designed this card with stamps from Annabelle's "Stamped for Christmas" and paper pieced the sled with kraft CS and scraps of pink and green papers. Used a circle die to cut the image and a beaded circle die ( which looks like a scallop circle) for the green mat. 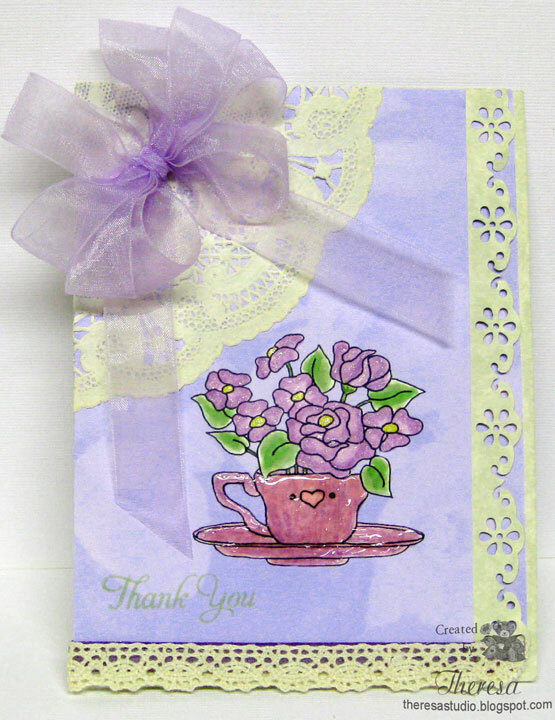 I placed this on a Kraft base card and stamped the sentiment in SU Pink Passion. Finished with some ribbons from stash and two wooden flowers with a pearl. 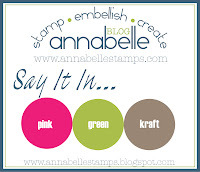 Annabelle Stamp Challenge: Say it in...pink, green, and kraft. Crafty Ribbons Challenge: Bingo Challenge-used middle row with Dies/Punches, Flowers and Ribbon. Hope wooden flowers count. The House That Stamps Built DCC1022: Recipe challenge- 1 image and 1 sentiment, 2 die cuts and 3 embellishments. Good Morning! I had 3 challenges in mind when I made this card - Lily Pad's Sketch challenge, Meljen's color challenge of Red and Gold, and Cute Card Thursday theme challenge of use word Sorry. I printed off 2 Meljen's Images: Sick Little Bear and Get Well Soon and colored with Copics and Metallic Markers. Added some Glossy Accents highlights. I cut with Spellbinders Square Die and Ribbon Tag Die (modified). The card base is red CS and layered with a K& CO pattern paper edged in gold and a strip of the same paper. I stamped a GKD Sentiment from the Botanical Set and embossed with Gold EP. 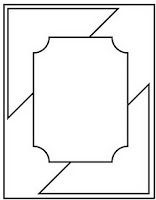 Assembled the card as shown in the sketch. Added the Get Well Tag with a scrap of Gold Metallic Ribbon. I thought this was a rather regal card for a Kingly Sick Bear who needs a lot of attention. Meljen's Designs Challenge 81: Use red and gold. Cute Card Thursday: Challenge 187 - Theme is Sorry Seems to be the Hardest Word! Their sponsor this week happens to be Meljen's. So sorry this little bear is sick. Cards for Men: Challenge is to use animals. 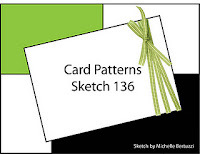 Lily Pad Challenges: The sketch at Lily Pad is by Nina Brackett. Hope you are well and happy today. 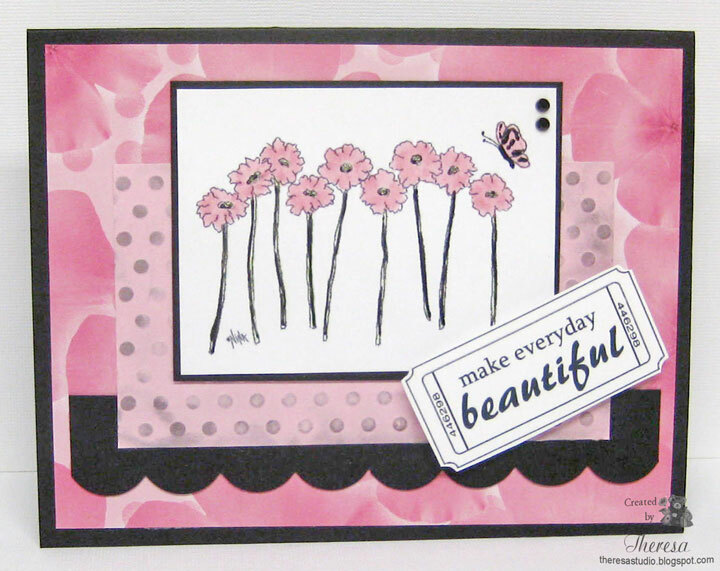 The challenge at Sassy Cheryl's blog is a sketch challenge (shown below) and the theme is to use pink. I used a lovely freebie image that I have had in my files for a while ...she just cries out to be pink. I colored her with Copics and Glaze pens and gave her some sparkle with a Clearstar pen. Those pink shoes are a bit on the neon side. But does she not look like she is having a lot of fun playing dress up? I used white card base distressed a bit with Sugar Spun Distress Ink, a mat of Pink CS embossed with EF Divine Swirls, and corners of Lace Patterned Paper from scraps. Cut my image with Nesties Labels 1 and also distressed a bit. Added pearls to finish. Think I will name her Diva Dianne since I do not know her name. Halloween is getting closer and closer with all its fun and spookiness. I have made another card using a poem/nursery rhyme that I found at The Wyching Well and printed on my card stock. The digi image of the cute witch "Higgelty" is from Tiddly Inks that I printed and colored with Copics and glaze pens. Added a sparkly brad to her wand. I cut her out with Nesties Circle die and placed on Green mat cut with Nesties Blossom die. I used orange CS from stash for the card base and added an edge of Green CS cut with Martha Stewart Drippy Goo Punch. The spider web in the corner is a rub on. When I finished the card, all these spiders (Confetti) crawled on to the card. Spooky!! 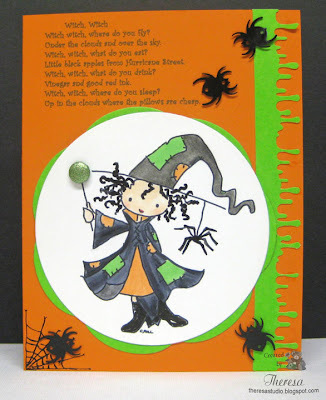 There's Magic in the Air: Halloween Theme with colors green, orange and black. Simon Says: Be inspired by nursery rhymes and fairy tales. This verse was listed as a nursery rhyme. 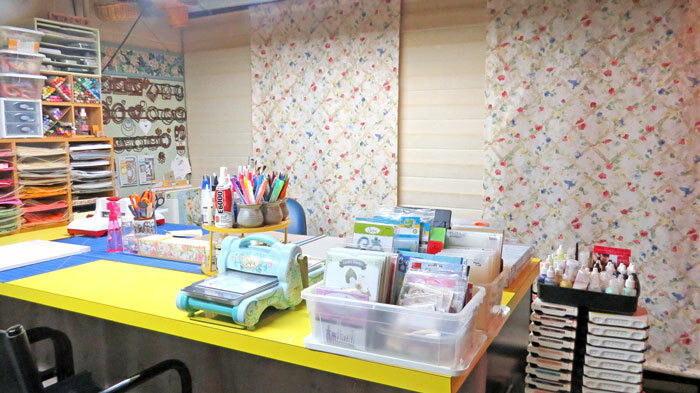 One Stop Craft Challenges: Theme is no designer paper. None used. Tiddly Inks Challenge 69: Halloween is coming. First time to enter here. Boo to you today!!! There are so many Halloween related challenges this week. 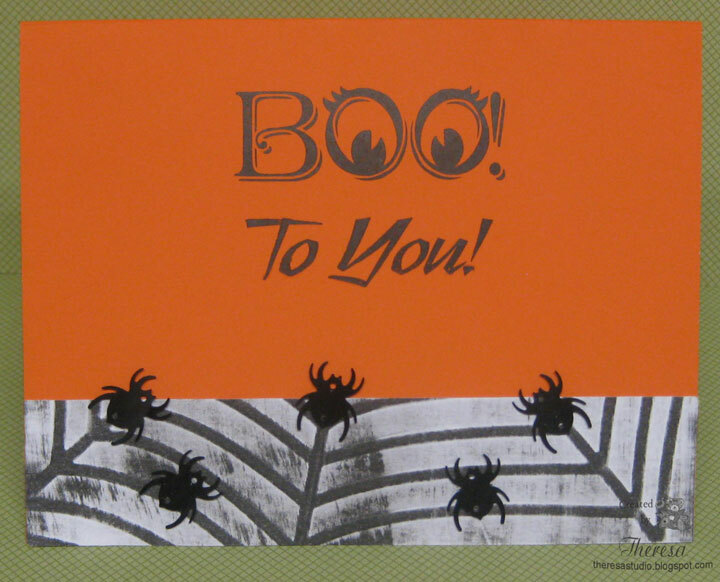 I just love this little Ghost stamp from Mark's Finest Papers set "Boo To You". I hope you are not tired of seeing him pop up on my cards. I doubled up the image because Speedy the Cat's Friends Challenge theme is Seeing Double and is also required by another challenge Double or Nothing at Beary Sweet. 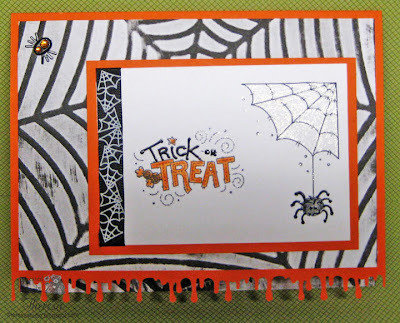 I used a card base of GKD Black CS with a mat of Spider Web Paper from Echo Park Apothecary Emporium pack. I punched the edge of mat with Martha Stewart Drippy Goo punch and added couple of ribbons. Stuck on some blingy spider brads for spooky fun. The ghosts were stamped with Memento Tuxedo Black on white CS and cut out. Colored pumpkins with orange Copics and covered with Glossy Accents to shine. 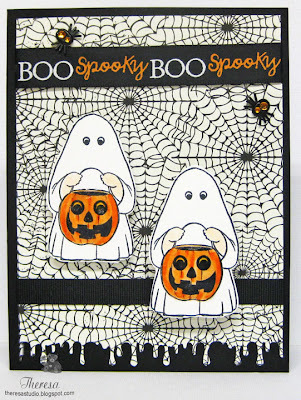 This card came together very quickly with these fun and spooky elements. Beary Sweet Challenge #36: Double or nothing-use 2 of something - 2 ribbons, 2 buttons, 2 images, 2 flowers, 2 whatever -- but only 2! Have 2 images, 2 blings, 2 ribbons. The ABC Challenge: B is for Boo! Party Time Tuesday: Totally Spooky and or Sketch. I chose to do spooky. Ribbon Carousel Challenge: Use photo inspiration (shown ) and use ribbon on your project. Inspired to use black, white and orange from photo. 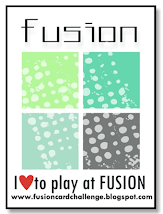 Fussy and Fancy: Use 3 B's- Black, Border Punch, Bling. Got the B's covered. Paper Pretties Wednesday Challenge: Color challenge-Use black, white , plus one color. Used orange. Are you ready for the spooky Trick or Treaters? I am stocking up on candy to be ready. 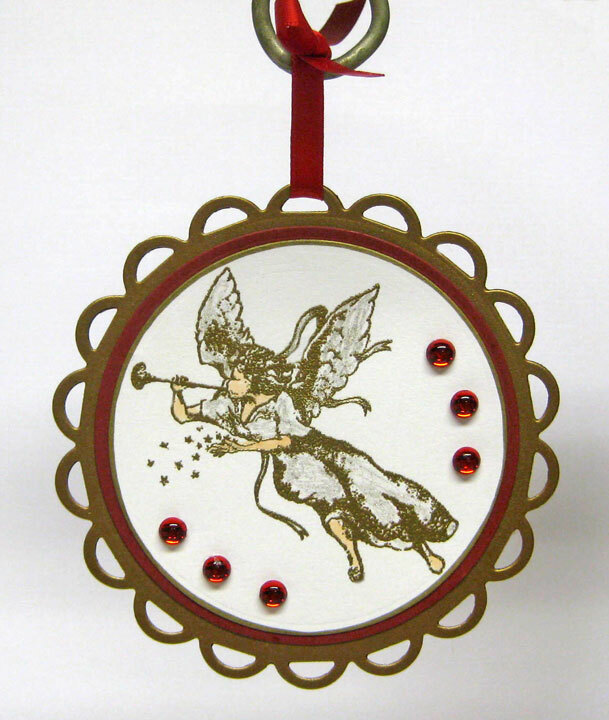 For the challenge at Craftyhazelnut's Christmas Challenge Blog this week, Hazel would like us to make a card that includes at least one bauble or something that hangs. I made this card by making another ornament to hang on the card using the same design as I used for another ornament. 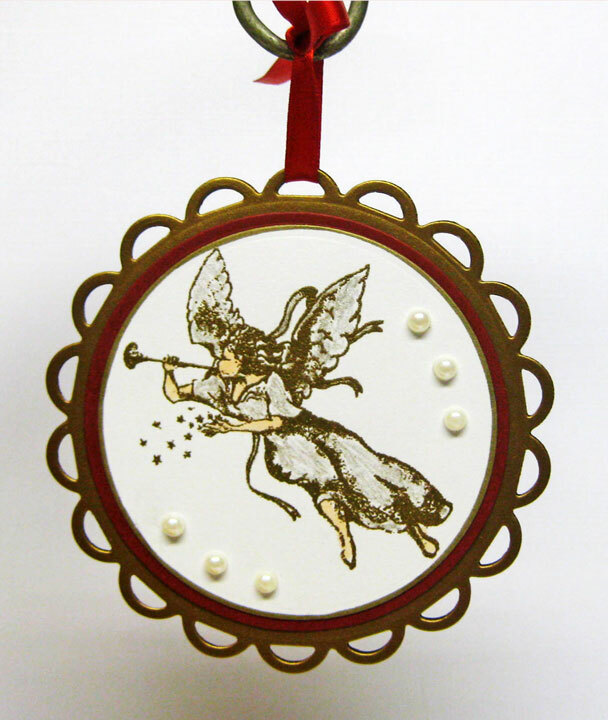 Rather than my repeating all the directions, please see all the details and supplies used for the hanging ornament at this post. My card is a 5.5" square of GKD Cranberry Tart CS that I embossed a part using Cuttlebug EF Kassie's Brocade to create a frame for the ornament. I also scored some lines to outline the embossed portion. I heat embossed a sentiment from Annabelle's "Stamped for Christmas" using versamark and Gold EP. Added some gold bling gems and a Gold Metallic Ribbon. I attached the finished ornament tied with a Gold Metallic bow for hanging with double side removable tape so it can be removed for hanging by the recipient. 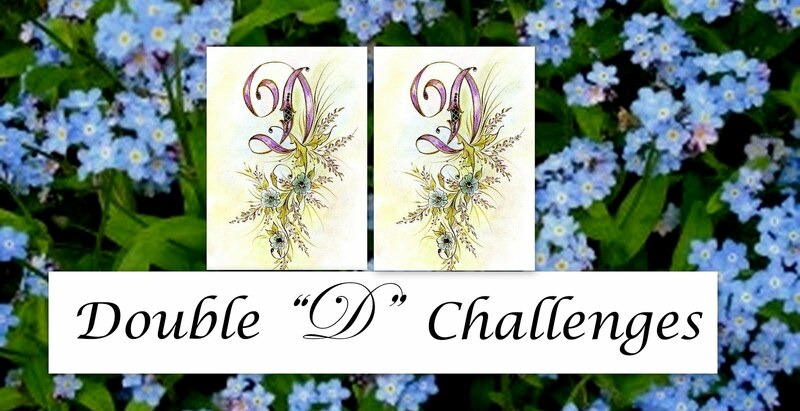 Charisma Cardz Challenge: Theme is embossing. I used both heat and dry. Another rainy, cloudy day in Ohio. This afternoon I made a card combining Annabelle Stamps Challenge to "Say it with Embellished Corners" and CR84FN Color challenge of Red, Brown and Kraft. 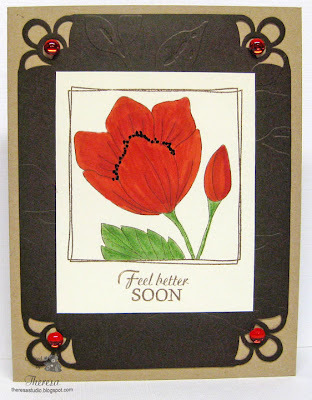 I stamped the flower from "Squared Posies" by Annabelle in Memento Rich Cocoa on Ivory CS and colored with Copics. Used a sentiment from Annabelle's "Dotted Flowers" with the same ink. 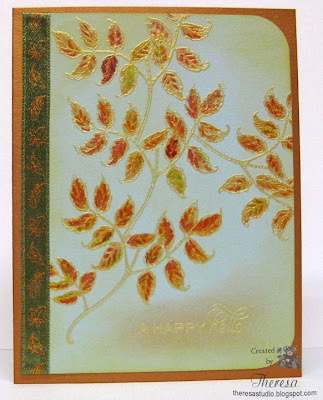 I layered the card base of Kraft with an embossed mat (used Cuttlebug EF Leafy Branch) of Chocolate Kiss CS with the corners punched with a Martha Stewart punch. Added Annabelle's Red Sprinkles to each corner for more embellishment. 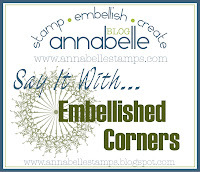 Annabelle Stamps Challenge: Say It With Embellished corners. 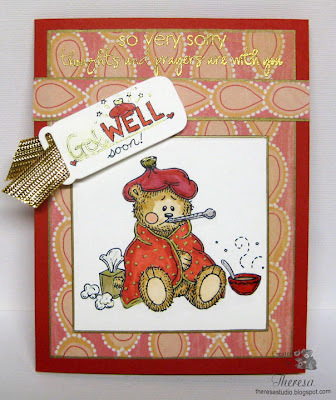 Crafty Catz Weekly Challenge: Get Well Soon. 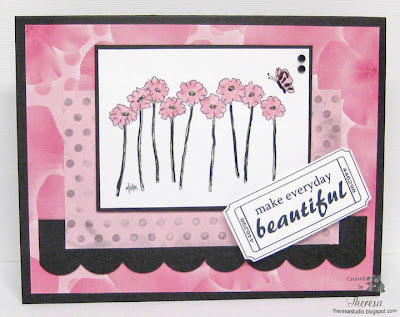 Stamptacular Sunday Challenge: We Choose-Anything goes. 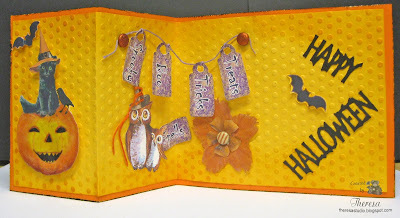 Charisma Cardz Challenge: Theme is embossing-heat or dry. I used dry embossing on the brown mat. May have to enlarge to see better since the brown is so dark. Sometimes when I make a card that I like, I will make another similar one but different. This is another one that I made using the Paper Cupcake digital image called "Teacup with Roses". This time I printed the image and cut out with Nesties circle die. I colored the cup and roses with Copics, markers, and pencils and did some creative inking and sponging on the edge. I placed the image on a doily for a vintage look and used a mat of lavender digital paper that I printed and embossed with Cuttlebug EF "Kassie's Brocade". I then sanded the embossed surface to distress and bring out the design in white. Used a corner punch on top corners and added a sheer organdy ribbon with bow to finish. The base card is a shiny CS that loks very pretty under the lavender paper. Entering this for a second entry at Sugar Creek Hollow, where we are to create a vintage, shabby chic or primitive card featuring vintage tea pots and cups. 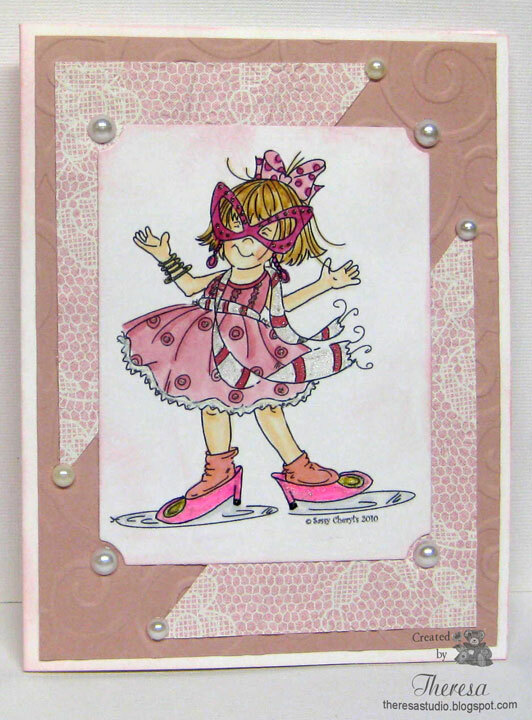 Once I see the photo, I think this card cries out for pearls...will add some before mailing. The Ribbon Girl : Color Challenge #12 is Lilac and Green. Lollipop Crafts: Challenge-No sentiment allowed. Good morning. Do you have time for a cup of tea? This card fits a few challenges. At Sugar Creek Hollow, the challenge is called VINTAGE TEA. 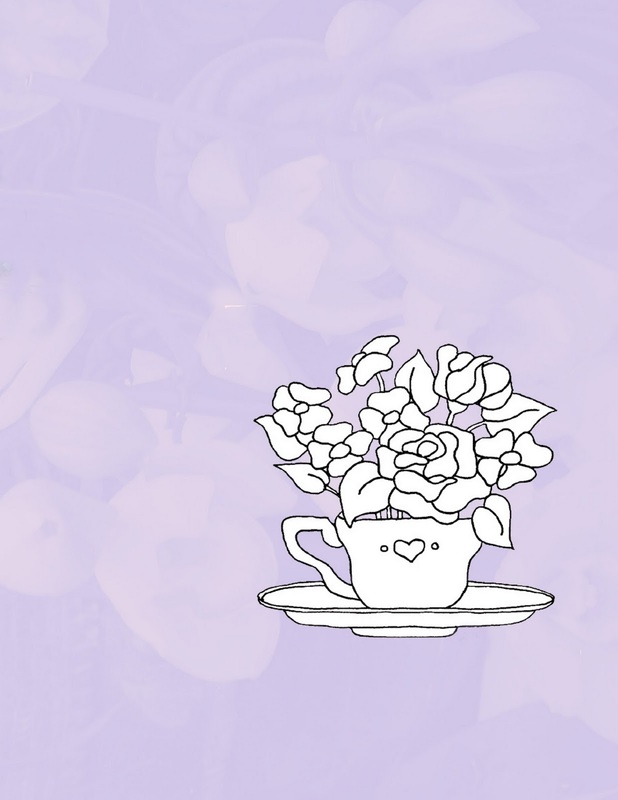 We are to create a vintage, shabby chic or primitive card or other paper-crafted project featuring vintage tea pots and cups. I am also entering other challenges to use lace/ribbon and lavender. 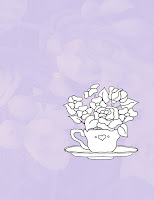 I used a Paper Cupcake digital image called "Teacup with Roses". I printed the image on a digital floral background found on my Photoshop files and adjusted the color to lavender and the size for my card dimensions. I then colored the image with Copics, added some Glitter to the lavender roses with Sakura Clearstar pen, and added Glossy Accents to the cup. 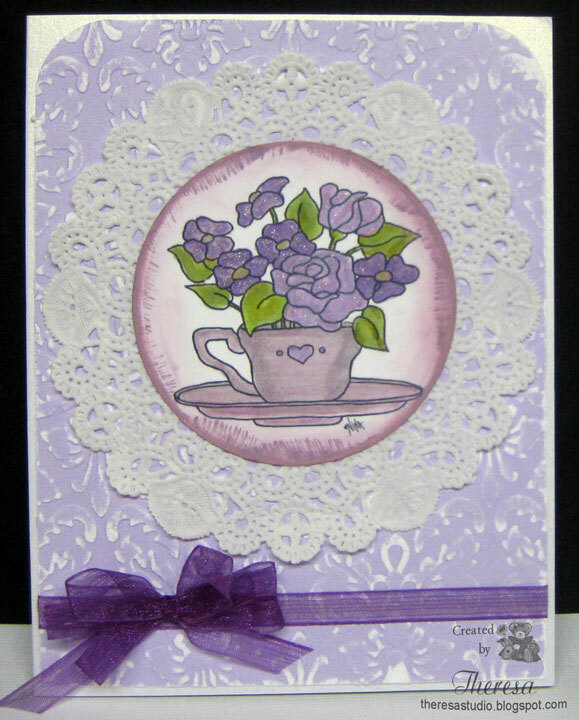 Used a base card of Parchment CS, punched the edge with Martha Stewart Floral Lace Punch. Attached the image layer with a Doily section on the corner, vintage lace on the lower edge (Lined with dark lavender ribbon), and a sheer bow of lovely lavender. Added a strip of lavender paper to the inside under the punched edge to highlight the punched design. 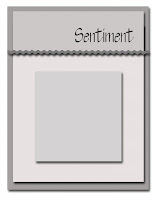 Sentiment from Flourishes stamped in SU green. There are a lot of challenges with Autumn / Fall theme this week. A few days ago I saw a card made by Linda , a blogger friend who is a wonderful cardmaker, that reminded me of a stamp that I bought several months ago and never used. I loved her card so much that I have CASE'd it...hope you don't mind, Linda. Here's her card. 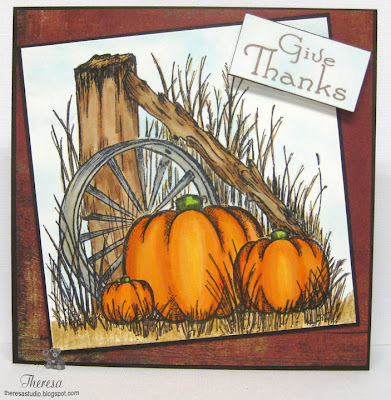 I stamped the pumpkin from Heartfelt Creations "Rustic Autumn Wheel" with Memento Tuxedo Black ink on to GKD PL white CS and colored with copics. I sponged the sky with Tumbled Glass Distress Ink. I matted the square image with GKD Chocolate Kiss CS. I used a card base of the same Brown CS and used a mat from BasicGrey Oliver ...a distressed dark rich Red Pattern Paper. Finished with a sentiment from MFP's Give Thanks. BasicGrey Challenges: Autumn/Fall/ Halloween. I used Oliver Paper Pack for the mat under the image. Oldie but Goodie: Forever Autumn-Autumn Images and Colors. My Stamp is over 6 months old but it's first time I've used. 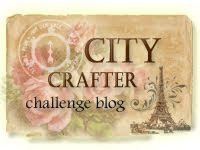 City Crafter Challenge: Harvest Festival -any project that relates to the harvest of the land Think this a good stamp for this Challenge. I can't seem to leave stamping leaves without doing another card. So I am back using some more GKD stamps, this time from "A Year of Leaves" set by Melanie. This was for practice of doing a sponged background with Distress Inks, but still need to practice for a more smooth look. After sponging, I stamped 3 leaves on the CS and stamped another to cut out for above the ribbon. I used a combo of markers and reinkers in fall colors to color the stamp....just played with getting different looks. 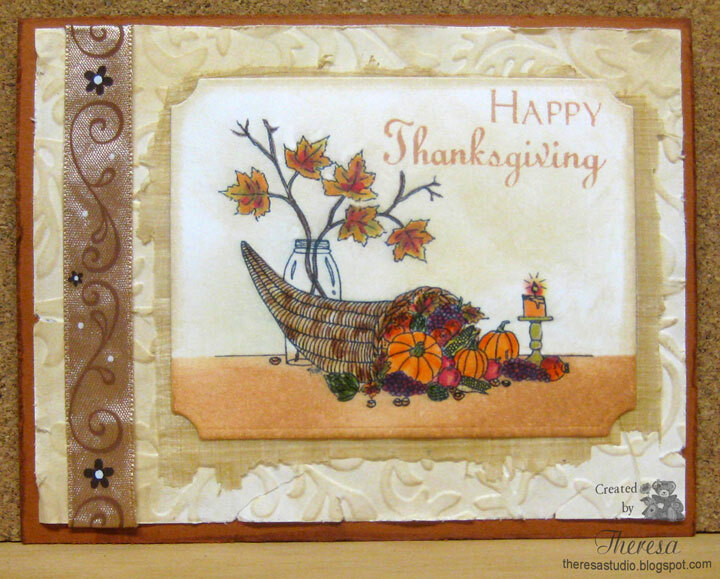 I used Kraft CS as card base , added some fall ribbon from stash, and stamped the sentiment with Versamark and heat embossed with Zing Chestnut EP. 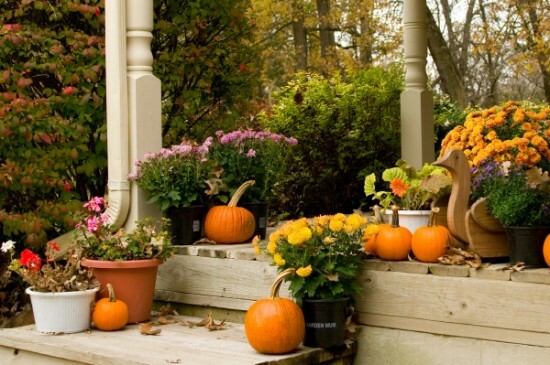 Stamp TV Mix it Up Monday: Focus on fall foliage. Kaboodle Doodles Challenge: Let's see those leaves. 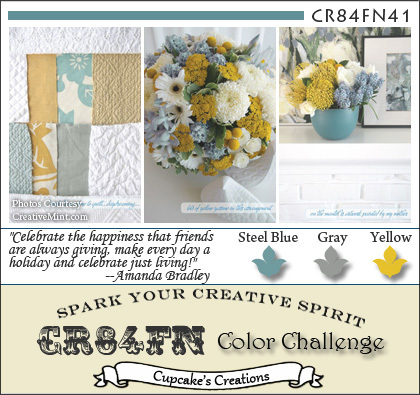 Fab 'n' Funky Challenges: Color Combo Challenge-Fall Colours. 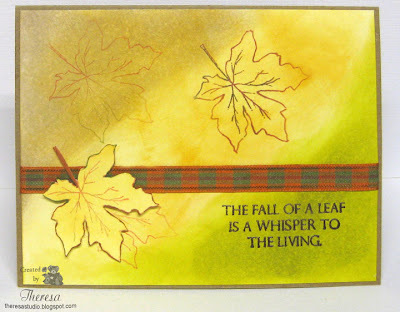 Stamp, Scrap and Doodle Saturdays: Falling For You-Anything with Leaves. Will leave you for a while before I return with another card. Maybe I will go rake a few leaves now, but it may be too wet. Hello Again. 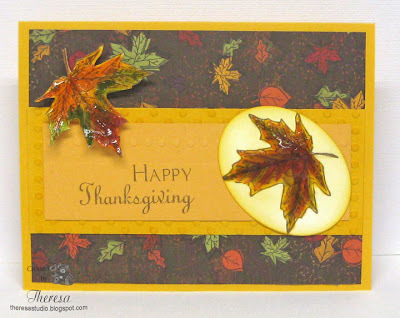 I am bringing you a card with a focus on Fall leaves and colors. I have stamped a couple of leaves with a GKD stamp from "Signs of Autumn" with Memento Rich Cocoa and colored with Copics. One I cut out with an oval dye and sponged with Distress Ink Wild Honey. The other I fussy cut and attached with pop-ups. The base card and one of the layers is SU Marigold Morning CS and other Papers from stash. Added some embossing with CB E Polka Dots and a border EF. Finished with some glossy accents on the leaves for some shine. Showing a lot of Fall colors in the resulting design. 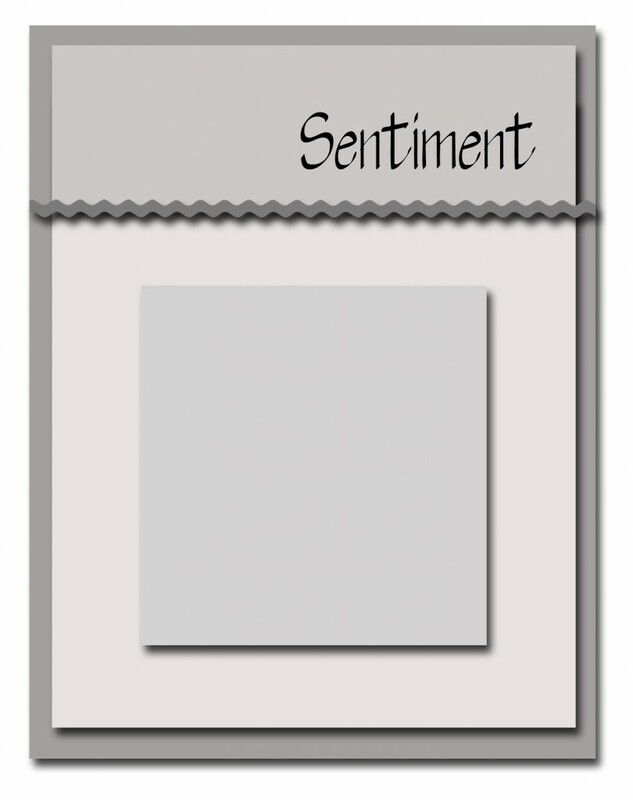 The sentiment stamp is from Mark's Finest Papers. Stay tune...I may have another leaf card heading your way shortly. Hello! Today I am showing a ornament ﻿﻿﻿﻿﻿ that I made for the challenge at Timeless Tuesday #139. The challenge is to make a Christmas card that either features an ornament, or create an ornament. I decided to make an ornament using Flourishes' Alleluia Angel stamp set. 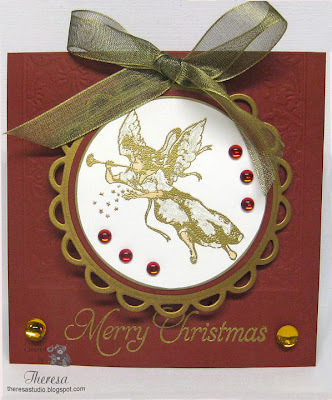 I began by cutting 2 circles from Gold Metallic CS with Spellbinders Lacey Circle dies. To each of these I attached a Red Circle cut with Classic Circle dies. On White CS, I stamped the angel twice with Versamark and heat embossed with Gold EP. I added some sparkle with Sakura Clear Star pen and color with Copic E00. I cut each with a circle die smaller than the red circle. I edged each with Gold Pilot Marker. I attached an image circle atop the red circles. I then glued the two finished sides together so the ornament may be presented from either side. I attached red jewels on one side and pearls on the other. I tied red ribbon to hang on the tree. 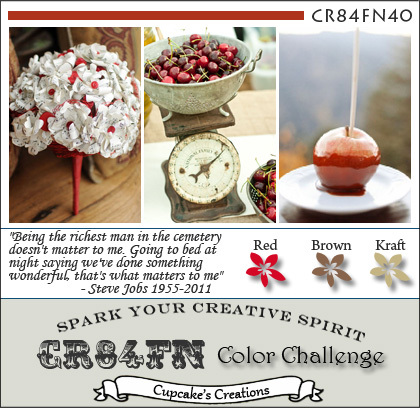 I made this card for the challenge of "Colours of Fall" at Delightful Challenges and used one of their Digital Delights "Mr. Straw" which I had never inked up but have had in my files for some time. I colored him with pencils and markers and cut out with Nesties Labels 1 and sponged the edge with Wild Honey Distress ink. 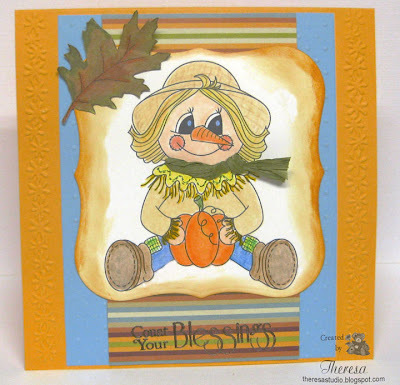 I used Orange CS base, some Bluesky CS mat and a stripe CS of Fall Colors. Did some embossing for texture and added a leaf that I stamped, colored and cut out for another touch of fall. The sentiment from Mark's Finest Papers is stamped in versamark and embossed with Zing Chestnut EP. Added a bit of green raffia for scarf. This card is nothing like I started to make....I printed the image larger that I meant to but just kept working with enlarging the entire design until I like the proportions. Digital Tuesday: Use fall colors. Speedy the Cat's Friends challenge this week is to Use No Designer Paper. I was playing and decided to do a quick one layer card....as far as I could go without DP. 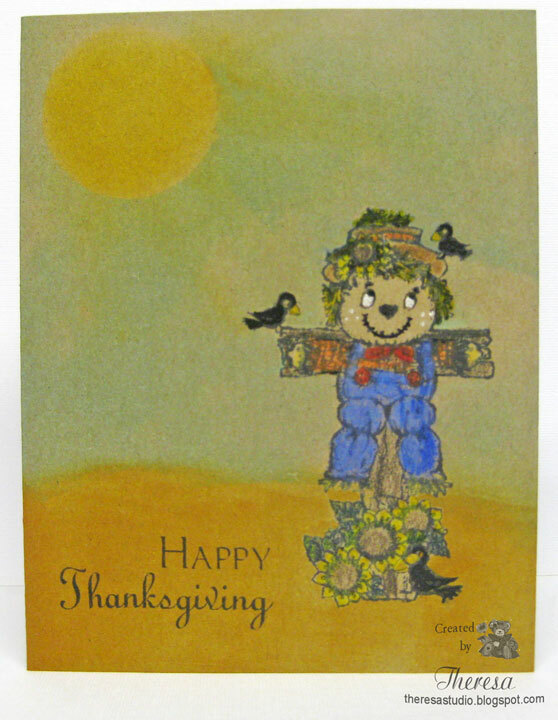 I stamped the scarecrow from Mark's Finest Papers' "Country Thanksgiving" stamp set with Memento Black Ink onto Kraft paper and colored with pencils. I masked the Scarecrow and sponged the background with Distress Inks. Also Masked a circle to do a Sunshine in the sky. Finished by using Glaze pens to highlight some of the design. I think I would have liked better details than this technique gives. Pencils did not color that well on the Kraft CS. Stamped the sentiment also with the black ink. Will plan to redo this card but it is what it is for now. 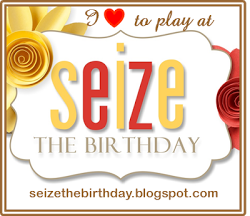 At Flourishes Release this week, Suzanne Czosek has a challenge to use our own name in a creative way! We are to simply use our monogram as the inspiration for a creation . Therefore I have to use the initials T-M-P to make my card. For T, I am using twine. The M will be Morning Glories or also could be Mosaic for the design of my pattern paper. P is for Pattern Paper or also Pink Paper. I used the Morning Glories Stamp from Flourishes "A Year in Flowers" stamped in Memento Tuxedo Black Ink and colored with Copics. I cut this with Nesties Labels 1 and framed in Pink CS also cut with 2 of the Labels 1 dies. I used the Mosaic Pattern Design Paper from K&Co. and placed on Bazzill Pink Paper. I wrapped the Mat with Green Twine and finished with a bow of the twine. I may go back and add some pearls or bling....think it needs something more. 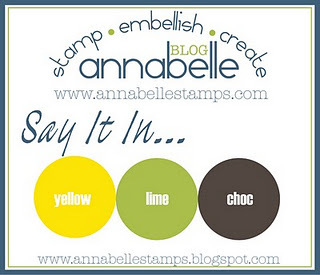 Annabelle Stamps' Challenge is to say it in Yellow, Lime, and Chocolate. 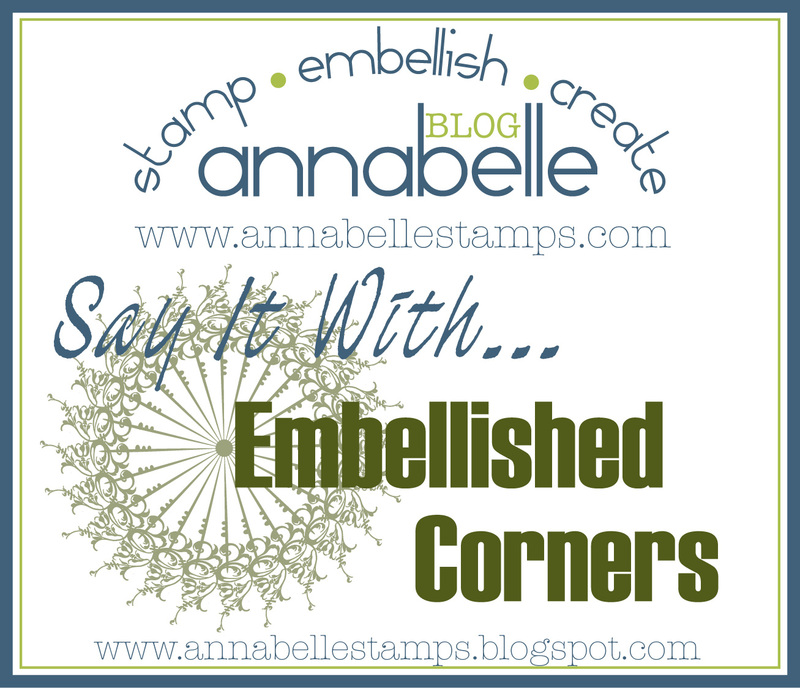 I am loving playing with my new Annabelle stamps. For this card, I used the image from Whimsey Flowers and a sentiment from Squared Posies. I stamped the image on white CS with Memento Tuxedo Black and colored with yellows, greens and brown Copics. I used a DCWV Pattern Paper as the base and layered a mat of the same design but darker lime green. Next is an embossed mat of yellow CS with Polka dot embossing topped with a chocolate CS mat. 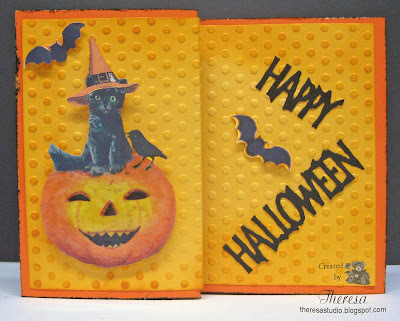 Added the image with foam squares and placed Annabelle sprinkles on the corners. A simple Hello sentiment finished the card. 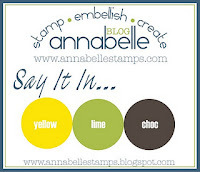 Annabelle Stamps Blog: Say it in Yellow, Lime, and Chocolate. Craft Your Passion: A card for any Occasion. Rainy day here...great for playing with paper. Sugar Creek Hollow is having a HALLOWEEN WITH A TWIST challenge. Plumrose Lane, their sponsor, is providing a wonderful freebie that we must use to make your vintage, shabby chic or primitive challenge entry. 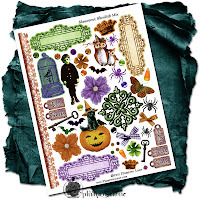 The freebie is a collage sheet of fabulous Halloween images along with an instant card and envelope. Collage sheet is shown below. Check out all the details at Sugar Creek Hollow and get the freebie. For my entry, I made a Z Card using an orange card base matted entirely with yellow CS embossed with a new Cuttlebug EF Polka dots. Edges of card were distressed with scissors and also distressed with Black and Wild Honey Distressed Inks. I cut out elements from the collage sheet and arranged on the card. Tags were added with purple twine and shiny orange brads. Tied some orange twine to the Owl's Hat. 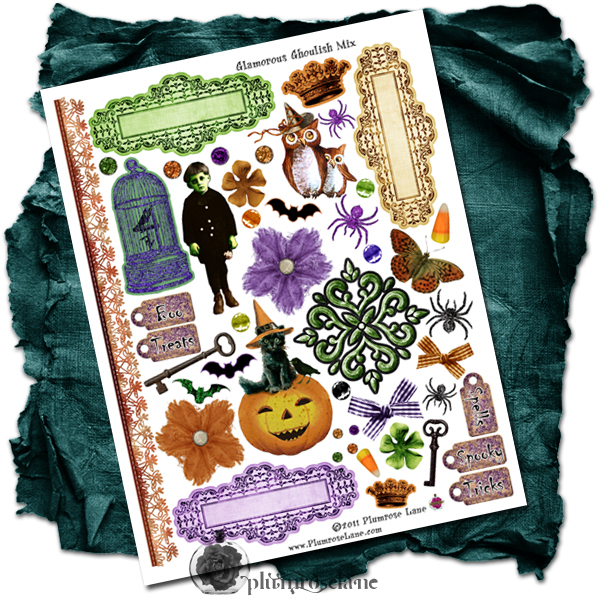 Sentiment was cut with Cottage Cutz Die from "Haunted House Border" . The elements from the collage have a very Vintage look which is what I tried to create with my design and colors. Sugar Creek Hollow: Halloween with a Twist. Lollipop: Critters - have owls, bats and a cat. I thought I'd make some tags to use for Christmas gifts and came up with these playing with Annabelle Stamps "Stamped for Christmas" set. I made 3"x3" square cards with White CS. I stamped the sleigh and sentiment on the front and used the "To" and "From" with the same sentiment on the inside. I colored the front image with assorted Copics, markers, gel pens, and glitter pens. 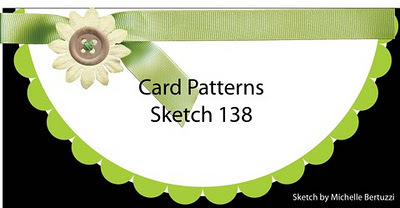 I may punch a hole in the card and add a ribbon when I use or just attach with tape. ABC Christmas Challenge: T is for Tiny. 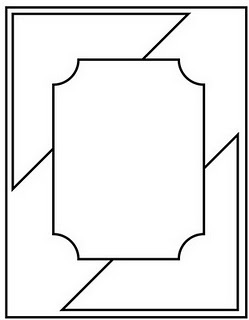 Make a set of 4 tiny cards or tags. Craft Your Days Away Challenge: Tag it. ABC Challenge: Anything Goes. Welcome back to this challenge. 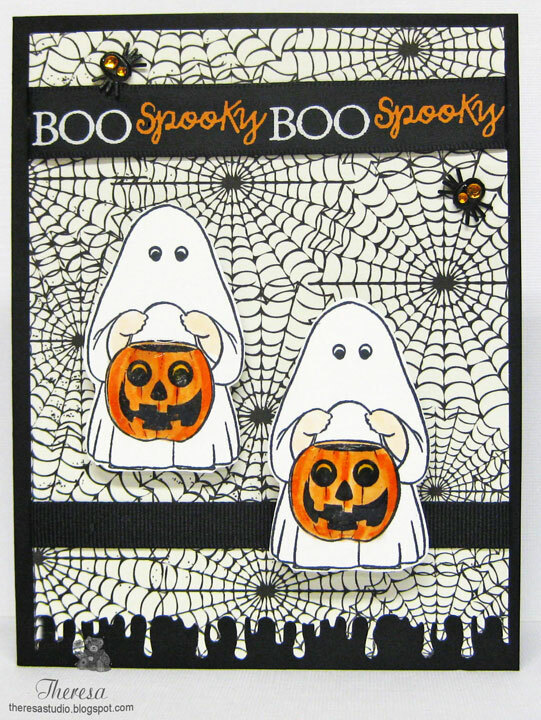 I am back with another Halloween card using Meljen's Designs on the front and Mark's Finest Papers stamps on the inside. For the front I used Orange CS as the base and punched the bottom edge with Martha Stewart Drippy Goo punch. Then I layered a mat of White CS that I embossed with Fiskars Webbing Texture Plate and highlighted with Memento Tuxedo Black ink. 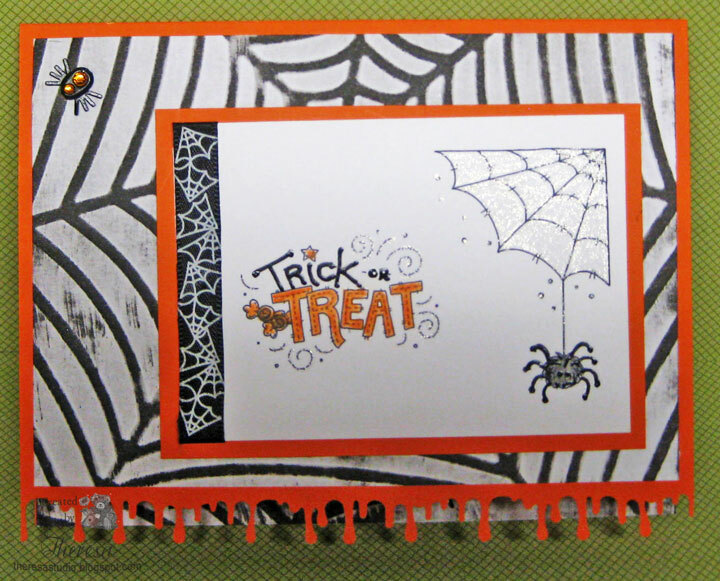 For the image I printed Meljen's Cutie Corner Spider and Stitched Trick or Treat Digis on White CS, colored with pencils and glaze pens, added some glitter with Sakura Clear Star Pen, added Spider Web Ribbon, and matted on Orange CS. Finished with a jeweled Spider Brad. For the inside I used MFP's "Boo To You" Stamp set in Memento Tuxedo Black on Orange CS, added a scrap of the outside mat with Web embossing, and added Spooky Spider confetti crawling up into the card. 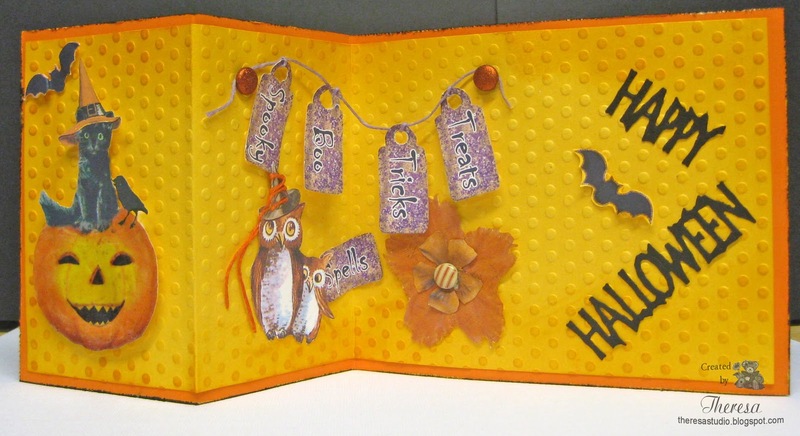 Fab 'n' Funky: Use die cuts and'or punches. Used MS punch and rectangles dies. Crafts and Me Challenges: Use Digi. Simon Says: Sparkle and Bling. Sparkle on the Web and Spider brad is the bling. Don't let the spooky spiders get you! For the Timeless Tuesday Challenge, we are asked to be inspired by the photo on the left for our creation. 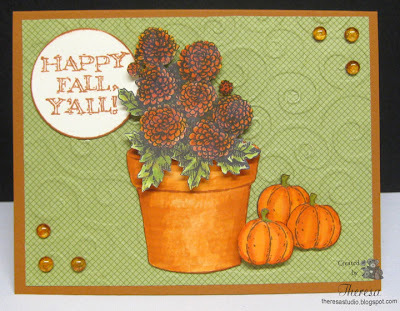 I have taken inspiration from the pots of flowers and the pumpkins on display for a fall card. I stamped the Mums from Flourishes "A Year In Flowers" with Memento Tuxedo Black and colored with copics and cut them out. I stamped a GKD stamp (Buds & Vases) of a pot in Memento Potter's Clay and colored with Copics....tried to give the "terra cotta" pot an aged look. The pumpkin stamp from Stampin Up was stamped 3 times with Memento Rich Cocoa and colored also with Copics and cut out. I placed an embossed mat of SU Green PP on the card base of GKD Pumpkin Spice CS. Arranged my cut out elements using pop up dots to give dimension to the flowers and pumpkins. Added sentiment from SU stamped in Potter's Clay ink and cut with Nesties Die. Finished with orange Dew Drops. 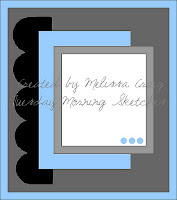 Flourishes Timeless Tuesday #138: Use photo inspiration. Cooking It Up With Katie: Recipe-Make it Fun, Make it Fabulous, and add your own "F Word! ".My F words are Fall and Flowers. My fun was coloring the terra clay pot and the look I achieved. You have to decide if it is fabulous. Fall colors are really showing on the trees today. Make sure to stop and enjoy the color display. Another Post for today...this card is for There's Magic in the Air whose challenge is to go green by either making a card/project with greens/neutrals and/or reusing/recycling items in your project. I kind of did both as I use greens but also used up some small scraps in my stash. I used Card Patterns Sketch 136 to make a very simple card with these unidentified scraps on a card base of white cs. I printed the sentiment from Paper Cupcakes "Thankful Quotes" and placed on a mat of yet another green scrap and popped on with pop up dots after adding a green twine from Annabelle Stamps. Quick, clean, and green and and I used up a few scraps. There's Magic in the Air: Go Green. The challenge at Cards for Men is A Sports Theme. I recently acquired this "Fall Ball Teddy" image from Meljen's Designs and decided to color him with Copics in Cleveland Browns colors...my DH is a Browns fan. 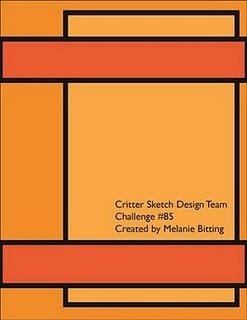 I used the Sketch from Critters Sketch Challenge...maybe because of the orange color? I placed the image on a Brown CS mat and then on a base of Orange CS. Just had to use those colors. 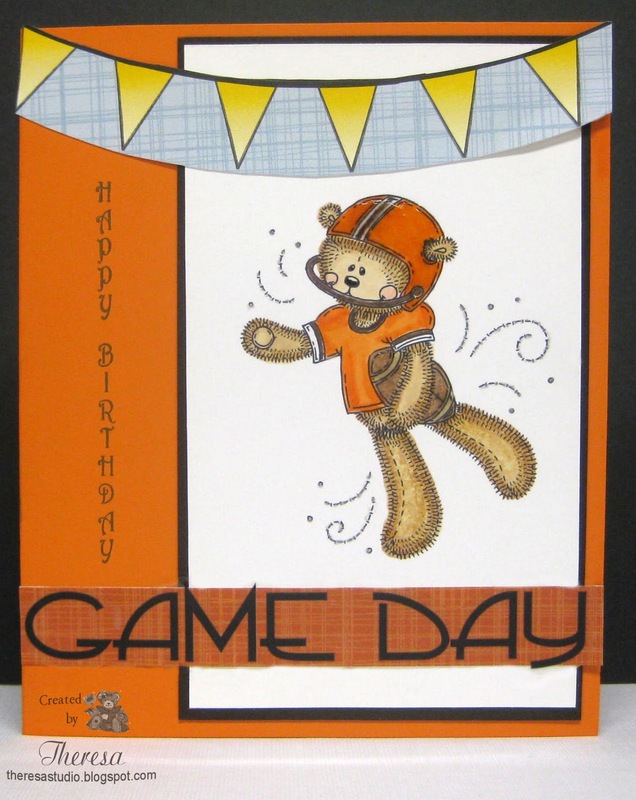 Added some Nikki Sivils Pattern Paper strips and used a "Sticker with Attitude" to go with the sports theme. Finished with sentiment stamp from Annabelle Stamps and glossy accents on the helment and football. This will be for my DH's birthday coming up this week. Card for Men: Sports theme challenge. Digital Tuesday Challenge: We Like to Party. A Brown's game is always time to party. All Sorts Challenge: Bear with us. Any football in your plans?